Within trace vapor analysis in environmental monitoring, defense, and industry, atmospheric flow tube mass spectrometry (AFT-MS) can fill a role that incorporates non-contact vapor analysis with the selectivity and low detection limits of mass spectrometry. 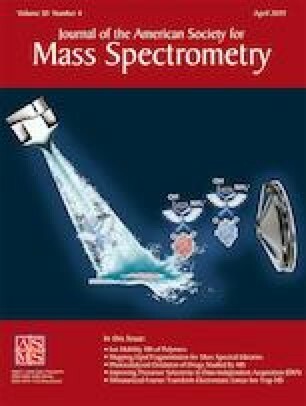 AFT-MS has been applied to quantitating certain explosives by selective clustering with nitrate and more recently applied to detecting tributyl phosphate and dimethyl methylphosphonate as protonated species. Developing AFT-MS methods for organophosphorus species is appealing, given that this class of compounds includes a range of pollutants, chemical warfare agent (CWA) simulants, and CWA degradation products. A key aspect of targeting organophosphorus analytes has included the use of dopant ion chemistry to form adducts that impart additional analytical selectivity. The assessment of potential dopant molecules suited to enhance detection of these compounds is hindered by few published ion thermochemical properties for organophosphorus species, such as proton affinity, which can be used for approximating proton-bound dimer bond strength. As a preliminary investigation for the progression of sensing methods involving AFT-MS, we have applied both the extended kinetic method and computational approaches to eight organophosphorus CWA simulants to determine their respective gas-phase proton affinities. Notable observed trends, supported by computational efforts, include an increase in proton affinity as the alkyl chain lengths on the phosphonates increased. The online version of this article ( https://doi.org/10.1007/s13361-019-02202-w) contains supplementary material, which is available to authorized users. Funding for K. A. M. was provided in part by the Army Research Office (Award No. W911NF1510619).